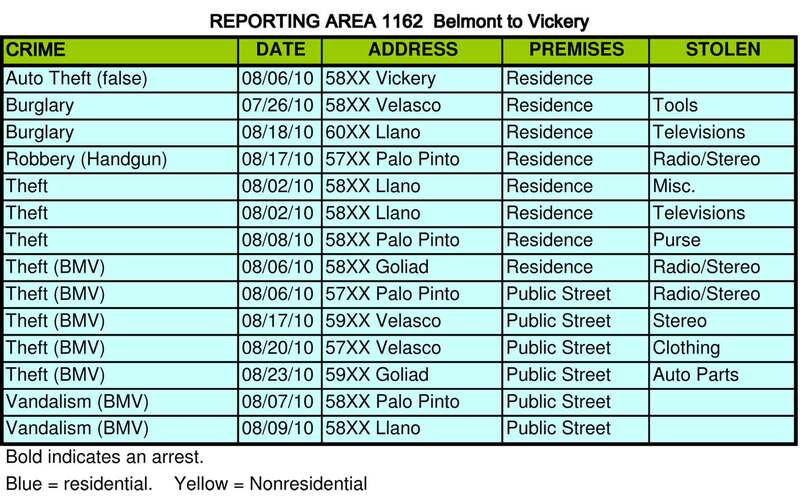 Crime reports for the month of August are below. After last month’s whopping crime wave, we asked our Extended Neighborhood Patrol officer to add an additional 5-hour patrol shift each week for a month or so. This is in addition to the normal 10 hours he patrols. We do not have enough members at this time to maintain that level year round, but things are getting back to normal. The number of home break-ins fell back to the typical level (from 21 last month to 13 this month), but car break-ins are still higher than we’d like to see. 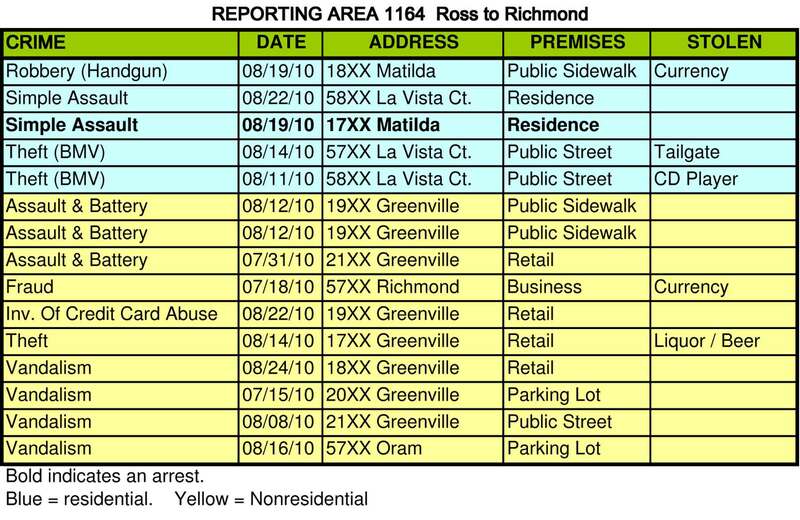 There were four robberies this month, three on our residential streets. One of the robberies mentioned above was actually a home invasion that occurred on the 5700 block of Palo Pinto. This occurred while the occupants were out of town and a house sitter was watching the property. Four latin males with guns pushed their way into the home when the housesitter responded to a knock at the door. She was bound and left laying on the floor while they tossed the house. Based on victim testimony regarding comments made by the assailants, DPD beleive this may be a targetted incident with a personal connection. We have not had an incident like this in several years, but just in case, I’d advise not opening your door to strangers, especially after dark. National Night Out is designed to strengthen community relationship between residents and public service organizations such as police, city departments and charitable organizations that serve the community. We will have police officers to talk to about crime concerns. In addition, the police will be giving demos of thier new next-generation Crime Tips system. (Imagine if the CrimeStoppers phone line went high tech and turned into a pretty awesome iPhone app.) We’ll have face painters, hotdogs and the kids free-throw contest. New this year, we’ll have a bounce house and a pie-eating contest that you definitely don’t want to miss! And if you ever worried about a lost pet, take advantage of low-cost pet micro-chipping being offered by Second Chance SPCA for only $25. This is a great opportunity to have some fun, meet some neighbors and learn a little something about crime and safety. Look for the light blue flyer on your doorstep. As I mentioned last month, police recovered a stash of stolen property in a stolen vehicle at Tietze Park. 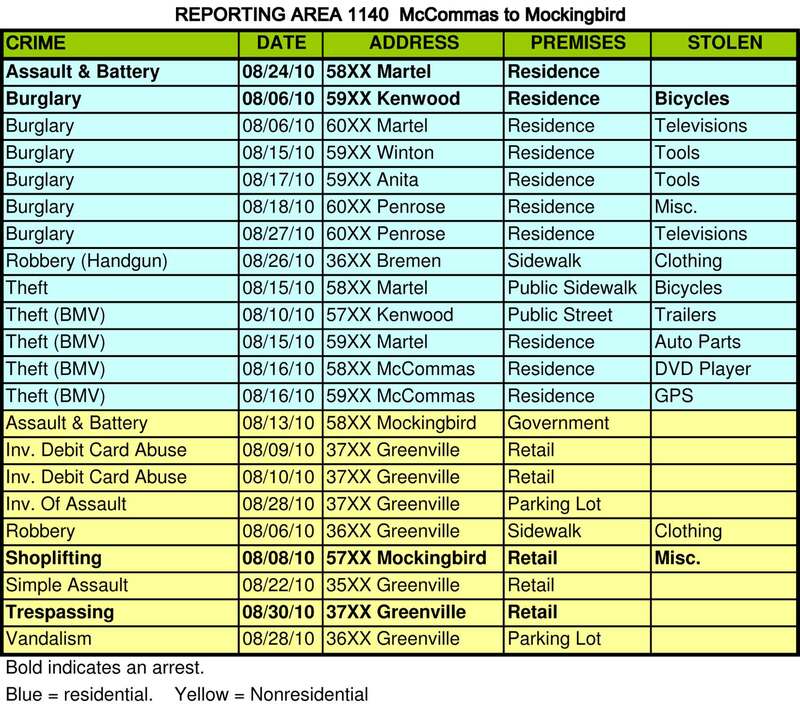 If you have been a victim of a car-break-in from June 26, 2010-July 18, 2010, please contact Officer Keith at ENP@LGNA.net. They might be able to locate your property. Each quarter, DPD hosts a public meeting for residents in the Central Division. The next meeting is Wed, Sept 22 at 6pm at St. Matthew’s Cathedral located at 5100 Ross. The meeting covers the entire Central Division which goes well beyond our neighborhood boundaries, but it is interesting to hear about the challenges and solutions they are dealing with in nearby areas. The public is invited to attend, so feel welcome. This would be a great chance to meet Chief Genovesi, our new Chief over Central Patrol.